BSB 2016 rumour mill – Who, what, where, when and why? JG Speedfit are looking good to receive the lion’s share of Kawasaki factory backing that Paul Bird Motorsport have had in the past. Where that leaves PBM, who knows? It looks like we could see a new Ducati team on the grid for 2016. Factory supported and possibly run by Paul Bird Motorsport. Whether that means we’ll see Shakey Shane Byrne going with long time friend and team boss Bird remains to be seen. Bird and Byrne have a great relationship with each other, and also with Ducati. Remember that sweet WSB wildcard double on the Monstermob Ducati back in 2003? If you don’t, watch this (terrible and sound free) footage from race one. Milwaukee backed Shaun Muir Racing don’t appear to be happy with the fact that Paul Denning and Crescent have picked up the job of running Yamaha’s WSB team in 2016. World Superstock success aside, the development of the R1 as a race bike seems to have been driven by SMR and Josh Brookes in particular. It seemed logical to assume that Brookes would benefit from the wins he’s given in BSB and be rewarded with a WSB seat. It also seems logical that SMR and Milwaukee would get the chance to run the team as they have all the experience gained in BSB. If the Crescent choice was one that was made by Yamaha Europe, rather than Yamaha UK, it would be a reasonable assumption that Michael Dunlop’s last minute exit from the Milwaukee backed TT effort this summer didn’t help a single bit. 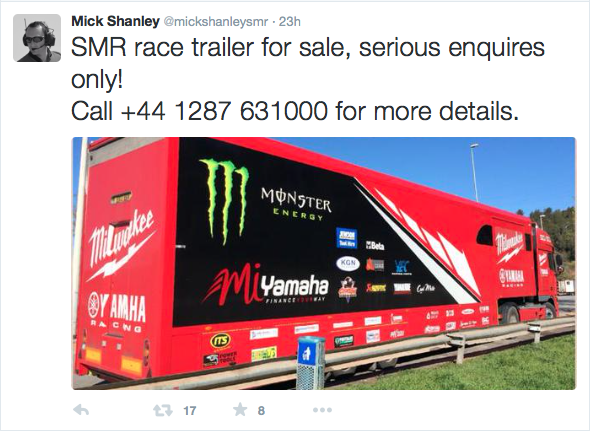 SMR have advertised their race truck and hospitality unit for sale on Twitter, that could be as simple as them rotating their stock for new kit, it could be SMR publicly flicking the bird at Yamaha. Again, time will tell. Yesterday we asked Josh Brookes for his opinion on the WSB Yamaha news, here’s what he had to say.